Welcome to our Diagrammatic Reasoning Test Guide. On this page you’ll find practice tests, coaching videos & 6 Top Tips for success. You can get hold of practice diagrammatic reasoning tests here. Take a look at our aptitude testing page here – It will be a treasure trove for you in preparing for your diagrammatic reasoning test. Ok, let’s cover the basics first. Then we’ll get into the detail of how to pass your diagrammatic reasoning test. What is a diagrammatic reasoning test? A diagrammatic reasoning test is very similar to a logical reasoning test. It’s an assessment that measures your ability to interpret data and solve problems. 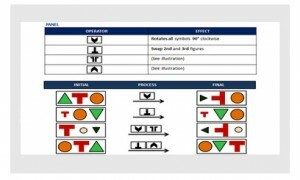 Diagrammatic reasoning tests are often used by companies to assess candidates who have applied for technical roles, or roles that require complex problem solving. Although diagrammatic reasoning tests are often accompanied by tests for numerical reasoning and verbal reasoning, many employers choose diagrammatic reasoning tests because they measure innate ability; skills that are less dependent on your cultural or educational background. How long is the test and how will I sit it? Unlike most other forms of aptitude testing a diagrammatic reasoning test may be computer based or paper-based. Either way, you can generally expect to answer around 20 questions, within a 30-minute time frame. So what’s in the test? You will be presented with visual information, in the form of diagrams or flowcharts. You will need to analyse the diagrams and then come to a conclusion as to the ‘rules’ that the diagram follows. You will then be asked to apply those rules by answering a ‘fill in the blank’ question or to specify how those rules might create a new situation of some kind. 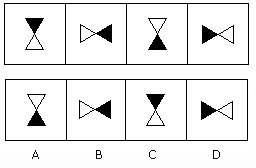 Have a look at this question and see if you can tell which image should occupy the space marked below with a ‘?’. In the above example the top row highlights the sequence, along with its inherent ‘rules’. You job now is to figure out what those ‘rules’ are. What patterns can you spot in this top row? Here’s a short video we made to walk you through the above example. This will tell you the type of thing you should be looking for during diagrammatic reasoning tests. We hope you found that video helpful? Most people struggle to understand the type of elements they should even be looking for in a diagrammatic reasoning test, so we hope this video has made it clear (or at least got you thinking in a different way). A central image that is increasingly getting larger. The colour of the central image has a sequence that runs: white, purple, blue, white, purple, blue. The shape of the outside image has a sequence that runs: square, square, octagon, square, square, octagon. The colours of the outer image – the sequence runs: purple, blue, white, purple, blue, white. Are all diagrammatic reasoning tests like this? 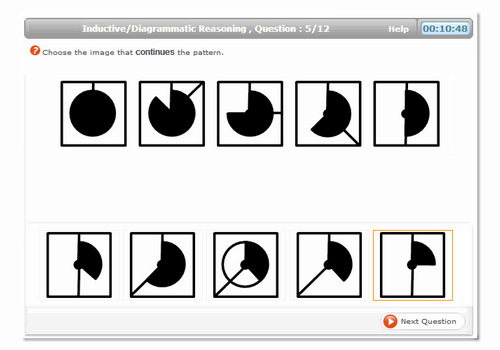 Most diagrammatic reasoning tests use abstract images like the example question above, but some use letters and numbers instead of shapes. The context may change but the principle remains exactly the same: Identify the rules/patterns contained in a sequence and then use them to pick an appropriate answer. Sometimes there will also be ‘operators’ and ‘processors’ sandwiched in between the elements of the question. The aim here is to understand what effect these have on the input elements. Again, the context has changed but the principle is the same: break the code/spot the pattern. As with all aptitude tests, the key to success is practice. The more you practice the better you get. It’s as simple as that. And this is particularly true with diagrammatic reasoning tests as the whole nature of the test is very abstract, so familiarity with the setting provides you with a real boost in both competence AND confidence. We always recommend these practice diagrammatic tests from JobTestPrep as they contain clear explanations for each question. This is huge as it allows you to pinpoint where you’re weak and then improve in that area. This genuinely transforms your chances of success. Ok, we’ve covered the basics of a diagrammatic reasoning test and we’ve looked at an example diagrammatic reasoning question. Now let’s look at some Top Tips for success. Not all diagrammatic reasoning tests are the same. There are several test suppliers and you need to identify which test supplier made your test. This will allow you to practice tests made by that same supplier. This is a brilliant ‘sneaky’ tip that most of the other candidates won’t know about. Use it to your advantage. You can learn more about the various test suppliers and find links to their tests on our aptitude testing page. Don’t be afraid to take the time to truly understand what you are looking at. It’s very easy to get flustered during diagrammatic reasoning tests, but you must stay calm. Study the diagrams and get your eyes used to seeing them and manipulating the shapes. This is where your practice kicks in. Just getting to grips with the types of question you will face and the elements of the shapes and patterns takes time. Giving yourself this time during your practice period will reap huge rewards in your actual test. It’s a good idea to note down the process functions and rules as you work them out. Arrange your thoughts by making notes, it will help you keep track, as some sequences can be circular and you can quickly lose track of your thoughts. Make sure you do this in a clear & methodical way as this type of testing can go horribly wrong if you misinterpret just one of the process functions. Believe it or not, you can train your brain to think in a more logical way. How often do you solve puzzles? Crosswords? Sudoku? ACTION POINT: Buy a few puzzle books from your local newsagents and run through them as part of your preparation. We don’t know why this works, but we know that it does. 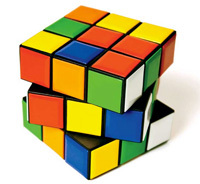 Get flexing those problem-solving mental muscles! During your diagrammatic reasoning test you must manage your time wisely. Knowing when to cut your losses with a difficult question and move on is a key skill. It can only be honed with practice. Don’t spend too long on one question. If it is proving too difficult, leave it and come back to it at the end if you have time. In the time you agonise over 1 tricky question you could correctly answer 2, 3 or 4 questions. Don’t dally. Keep the momentum going. Top Tip 6) Practice. Practice. Practice. If there’s one thing that separates successful candidates from unsuccessful ones it’s this. Successful candidates always take the time to prepare. There is nothing you can do to prepare that will give you a bigger boost in ability than taking practice tests. Practising lets you get used to the types of diagrams you will encounter and it allows you to learn from your mistakes. We always recommend these practice tests as we like the explanations. Practice little and often. 30 minutes a day during the 2 weeks before your test is ideal. We hope you found our Diagrammatic Reasoning Test Guide helpful? We value your feedback and would love to hear how your test goes. You can contact us here. Good luck in your future career and in your diagrammatic reasoning test. Visit the aptitude testing page for more advice and guidance. You can find more help with assessment day activities (role-plays, group exercises etc) in the assessment centre section. This is a useful practice test from Assessment Day (Click here) and another (here) and even another (here).